June 23, 2008 – What's Up?! 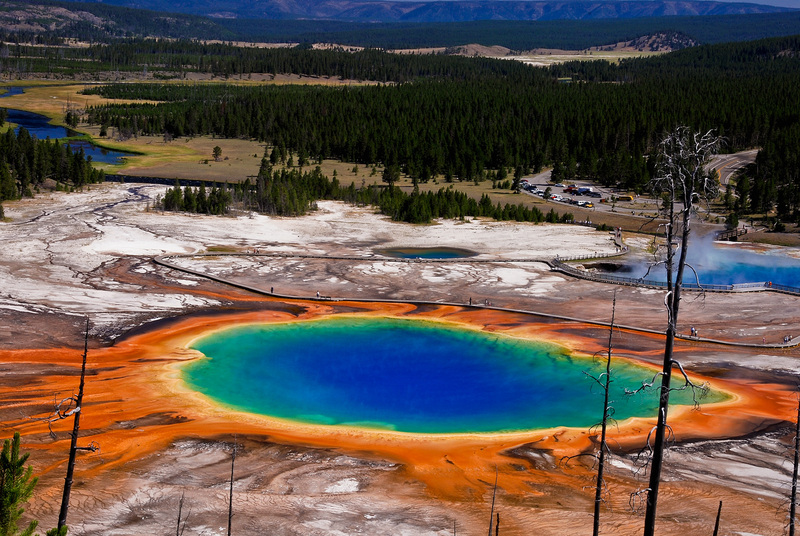 Yellowstone National Park has some of the most beautiful hot springs found in the world. 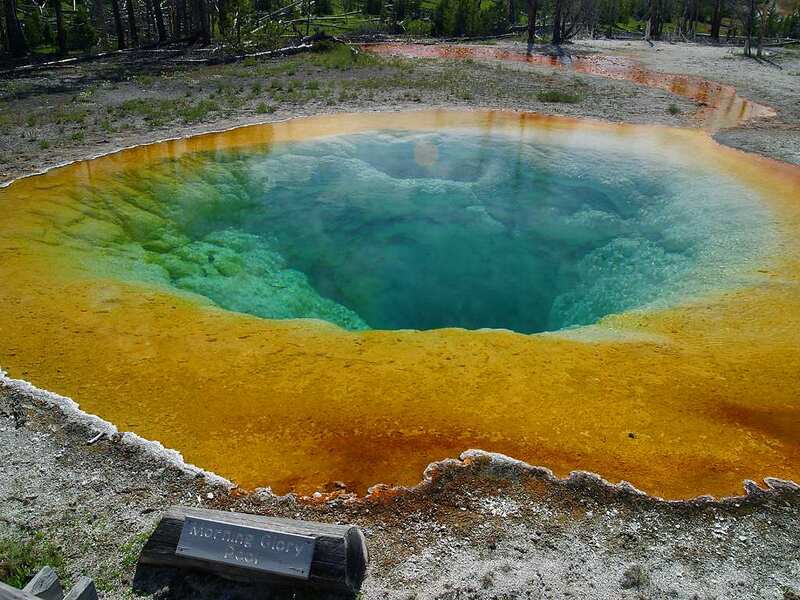 Morning Glory Pool is a hot spring in the Upper Geyser Basin of Yellowstone National Park in the United States. It was named in the 1880s for its similarity to the morning glory flower. The distinct color of the pool is due to bacteria which inhabit the water. Several entryways have been clogged due to objects being thrown in by tourists, reducing the hot water supply, and in turn altering the overall appearance of the pool. On a few rare occasions the Morning Glory Pool has erupted as a geyser, usually following an earthquake or other nearby seismic activity. Several attempts by park officials to artificially induce eruptions to clear the pool of debris and clear blocked entryways have been met with mixed results. The Grand Prismatic Spring in Yellowstone National Park is the largest hot spring in the United States, and the third largest in the world, next to those in New Zealand. 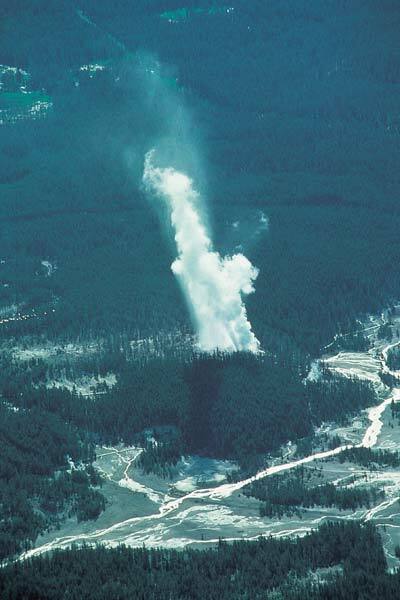 Steamboat Geyser, in Yellowstone National Park’s Norris Geyser Basin, is the world’s tallest currently-active geyser. During major eruptions, water may be thrown more than 300 feet (90 m) into the air. Steamboat’s major eruptions last from 3 to 40 minutes in length, and are followed by powerful jets of steam. Steamboat does not erupt on a predictable schedule with recorded intervals between major eruptions ranging from four days to fifty years. Cistern Spring, located nearby, will drain completely during a major eruption of the geyser; the spring refills within a few days.